That's exactly what happens when a marketing automation tool is acquired. We expect that now that we have this fancy tool, it will run smoothly, by just one click of a button in maximum 1 month time. Now reality is that a lot of marketers feel stress to fail or even begin implementing it. There is a huge reality gap between management expectations and marketing operations. A marketing automation tool is just a toolbox. You still need the strategy to fit it into your business strategy. You will need to integrate in your global technological landscape. Plus you need to train your staff not only in how to opperate the tool, but understand the underlying capabilities of it. So plz, take your time to learn and surround yourself with experts helping you to define how you can make optimal use of your new super technology. ​If you don't know what Watson is. I strongly advise you to take 12 minutes of your time and see what it can do for your next marketing profiling. You'll be amazed what this new AI by IBM can do for CRM and other data driven knowledge. ​For a while now I'm a huge fan of Econsultancy. Always great content, to the point and very hands-on. This new article about the unsubscription process of Zalando, I really had to share. It's describing perfectly what I've been preaching for years now in all of my projects. Not everybody is convinced by it and sometimes companies are even afraid to use it, concerned about the consumers reaction. Now that Zalando is doing it, I hope that they will be convinced that this is exactly the way you should approach an unsubscribe. Unsubscribes are mostly generated by: bad or irrelevant content, frequency of the communication or even the use of a new email address. So the best way to deal with it is to gently ask people if they want to change their subscription preferences. That could result in a huge win-back or at least give you an insight on why people are leaving you. It all started a while ago on a lazy Sunday evening. I was watching some TV and a nice Jaguar spot triggered my interest. 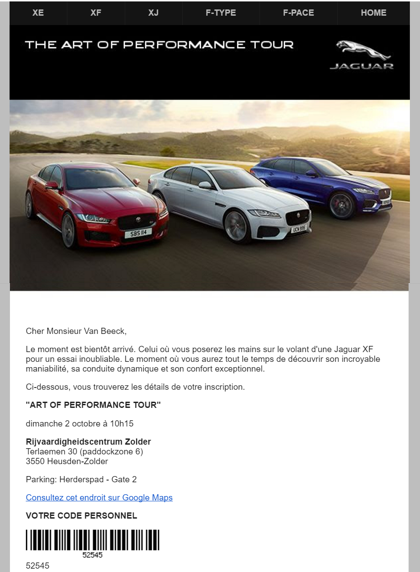 A Jaguar as from 299 EUR a month, was this possible? I immediately went on to their website via a Google search. Nothing special over there, but indeed, there it was. The XE was available as from 299 EUR a month. The main call to action was: get some info or book a test drive at your local dealer. Naah, I'm done here, I was just curious. Case closed. BUT than it started. Some days later I saw an advert Facebook ad. This time they were not promoting a simple testdrive, but rather a track day at Zolder (one of Belgium's few F1 tracks). Since I am, as part of my job at Emakina, working on digital strategies for SEAT and SKODA, I wanted to know more. A few personal data and the time slot of my choice was enough. They would contact me later. OK.
Wow, later they said?! Exactly 3 minutes later I got my confirmation email. Personal bar code included. Nice! OK than, let's go all the way now. Let's do it. My appointment was a week later and there was no extra communication what so all. No sales people pushing or calling me for their next best deal. Nothing. They stick to the promise. Even better, I was friendly reminded the day before by a sms with the exact time and place of the gathering. So on Sunday, I went over there. Everything was smoothly prepared. I had opted for a XF and I even could choose the available type at the location. During a small 15 minutes introduction over coffee, a very enthusiastic Jaguar representative gave some insights on the origin of the brand. He admitted that they had been through some rough times, but that since TATA invested in the brand, everything was getting much better. Even some sales figures and production details were shared. Ok, of we go in a small group of 20 people. First a small slipping course on the slippery track (me at the wheel, some instruction via intercom). This was their way to show off the dynamic driving programs of the automatic transmission. Followed by a drifting session with the F-type (damn, with professional driver and me the passanger). The entire experience lasted some 45 minutes. Now it was time for some of track and some standard on the road driving. We switched cars (I got my desired model) and get to drive it again for 45 minutes on a pre-defined tour. The next group was already starting the track experience. No show off at all until now. Just a great experience, for what I must say, an impressive car. Getting back at the track location we got plenty of time to do a thorough inspection of some showroom cars and ask questions to the very friendly, enthusiastic crew. And yet, stil no sales pitch, they let the car speak for itself! All that heavy work made us hungry, so there was a small walking buffet and drink. We all got handed a thank you package with personal voucher of 1500 EUR, some nice looking brochures and the singlet we were wearing had apparently a hidden USB stick with show reals of the cars. I am totally impressed by the professionalism of the staff, the perfectly timed communication and the experience selling principle. There was no extra sales call, nor communication following to it. I love the feeling that I am appreciated as a consumer and that this company is giving me the time to decide on my own tempo. But I'm still curious to see what will follow. ​It has been on my mind for years now, I even remember talking about this when I had Thomas Cook as a client and here it is! Based on a few parameters and visualized as an equalizer, TripTuner provides you with a selection of matching holiday destinations. Ones you make your selection you are provided with some insides of the destination, some great pictures and a link to a selection of hotels. Great concept it is. My only concern is the content. It doesn't seem that it is frequently updated and the number of destinations is by first impression somewhat limited. Vixole came with a pair of intelligent sneakers. Not only are they connected via Bluetooth to your mobile device, but you can customize the built in led screens. More than a gimmick, this new type of shoes are the perfect example of how everyday objects enter the internet of things. These shoes have the ability to be customized according to your current mood, will notify you by vibrating if you come close to a specific object of your interest. The company jumped on the summer hype, by adding specific Pokemon features. But apart from this hype thing, think about the opportunities to easily collect data. Explore the led screens possibilities and play with some geo marketing. Marketing Automation is mostly known for the way how lead scoring is combined with drip nurturing email marketing. In this specific case for My Way, the major European distributors of Volkswagen, Skoda, Seat and Audi, marketing automatuion was used to re-target personalized banners. The cased was developed by Emakina and used Selligent technology as the central marketing automation. Selligent was combined with an API integration of DoubleClick and Klipfolio. Enjoy this funny and very successful customer bribing case! How to combine customer intimacy, product leadership and operational excellence. This spot is the perfect example how you combine an iconic brand with modern customer values.